The Fellowship was fortunate enough to obtain a copy of POPEYE #1 from IDW Publishing. The story is by Roger Langridge with art by Bruce Ozella. Castor Oyl comes up with a crazy scheme to find a mate for Eugene the jeep so they can sell the litter and make a lot of money. He and Olive shame Popeye into using his boat and set out to find the mysterious island. They are joined by Wimpy who rather be with them than the cook who he skipped out on paying his bill. After coming across Bluto’s ship (and fight that you knew you would see), Popeye and crew make it to the island, but who or what lies there waiting for them? I am more familiar with the cartoons than the original comics and comic strips, but this was a fun read. The book invokes the spirit of the original Fleischer Studios’ cartoons, rather than the later ones released by Paramount Studios. Bruce Ozella does an incredible job of duplicating E.C. Segar’s style. Roger Langridge captures the characters voices and writes an entertaining story. If the rest of the four issue mini-series is this good, I wouldn’t mind seeing this as an ongoing. 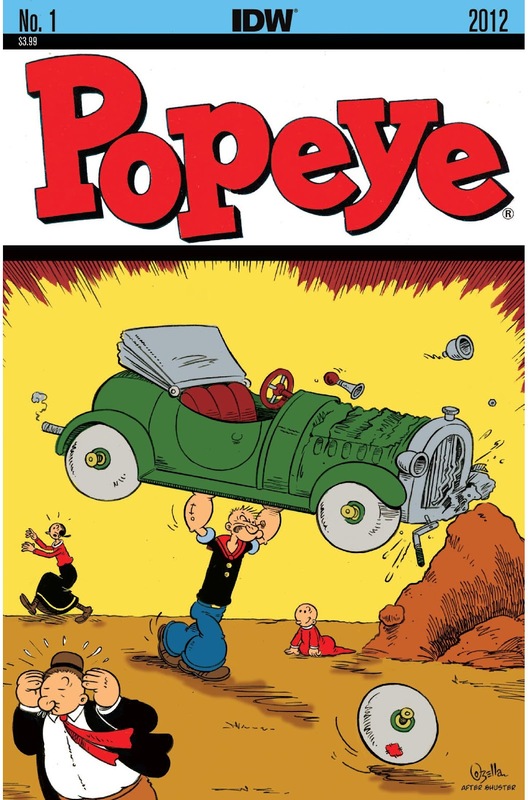 POPEYE #1 is in comic book stores now or available at www.idwpublishing.com.